This home sits on 20 private acres with spectacular views of the surrounding mountains. 4,300 square feet of living space with four bedrooms and three baths. This is a newer home with a billiards room and wet bar, an outdoor hot tub, and plenty of space for up to 8 guests. Brief description: This beautiful retreat offers privacy and all the comforts of home after a day on the river or hiking in the Crazy Mountains. The unobstructed views from the large living room windows and front decks are amazing. The Yellowstone River and Big Timber Creek are just a short drive away and access to the Boulder River is just 15 minutes away. The home features a large billiards room with a hot tub and grill on the back patio to enjoy. Bedrooms and baths: There are four bedrooms in the home. The large master bedroom is located on the main level with it's own master bath. There is a king sized bed, walk-in closet and on the private deck are Adirondack chairs. The master bath has granite counter tops with dual sinks, a wonderful jetted tub and a separate large walk-in tiled shower. Also on the main level is a second bedroom located off the living room with a double bed. There is a separate bathroom right across the hall with a shower and tub combo. On the lower level of the home you will find the other two bedrooms each with walk-in closets. The first bedroom has a king bed. The second bedroom has a double bed. There is a full bathroom off the hallway with a tub/shower combination. Kitchen: A chef's paradise! The large kitchen has beautiful granite counter tops, stainless steel appliances, a walk-in pantry and an island with a four-burner stove and seating for three at the bar. It's stocked with all the tools you'll need to prepare your own meals. In addition to the dishwasher, microwave, and coffee maker, the kitchen has dual ovens. There is also a gas barbecue for your outdoor grilling on the back patio. Dining area: There are two dining tables. One is located just off the kitchen with seating for six. The second dining table is in the living room area and will seat six more guests or could be used as a game table. Living room: The living room has vaulted ceilings and a huge rock gas fireplace flanked by big double windows that look out to the incredible views. There is a plush love seat and couch to relax and cozy up to the gas fireplace. Family Room: In addition to the living room, there's a large family room on the lower level with a gas fireplace, large flat screen television, 2 chairs and a couch. The hallway off the family room is where you will find the other two bedrooms and baths. There is a billiards room just off the family room with a pool table and a really neat wet bar with barstools. The wet bar has a sink, microwave and mini fridge for entertaining. The back patio is accessed off this fun room where you will find the hot tub and grill. 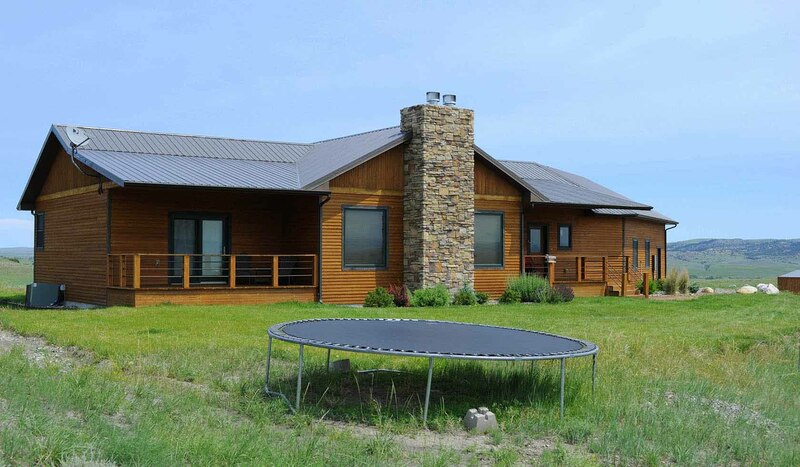 Setting, acreage, views: Beartooth Retreat is located in the foothills above Big Timber. The home is on 20 acres with the Absaroka Beartooth and Crazy Mountain Ranges in view. Activities nearby: Drive up the road into the beautiful Crazy Mountains where you will find great hikes, waterfalls and lakes to explore. Just south is the Boulder Valley with Natural Bridge State Park. Visit nearby Prairie Dog Town State Park or go horseback riding, golfing, or rafting. The Yellowstone and Boulder Rivers are both close by and offer world-class fishing. The town of Livingston is only 30 minutes away and the north entrance to Yellowstone National Park is just under 2 hours away. It's beautiful wild country! Closest town and airport: You are only 8 miles from downtown Big Timber and 78 miles from the Bozeman airport and 92 miles from the Billings airport.